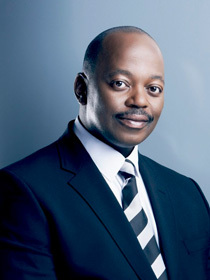 Peter Ndoro is a well-known Radio & Television Presenter in South Africa with more two decades of experience as a broadcaster, both in television and radio. He is a familiar face and voice in Africa. He recently returned from a three year stint as a news anchor/producer at the BBC World Service in London. There he specialised in Pan-African news and current affairs. Other appointments in the past saw him producing and presenting business programmes for CNBC Africa where he was also the Director for Corporate Communications. He also spent some years at SABC Africa presenting their flagship breakfast news programme. Other assignments include work at the business channel Summit TV as a prime-time Business News Anchor and as a Presenter on the Pay TV channel, M-Net. Listeners also heard his voice on Talk Radio 702, Highveld Stereo and SAfm. Peter trained as an accountant at Coopers & Lybrand and graduated from the University of South Africa with a degree in Accounting. Prior to entering the broadcast arena, he worked in accounting, advertising, marketing and business management. He has also managed his own television and video production company. Peter has been once voted Best Male Television Presenter in South Africa by People Magazine.